Seems like it JUST left but it’s that time of year again Apple Chill 2019 going down Saturday April 27th at the Rockingham Drag Way located at 2153 North US Hwy 1 Rockingham, NC, Gates open at 10am and don’t shut down till the party is over (10pm) Over 500 Car and bike clubs have ALREADY pre-registered! We have $1000 for the largest bike club on set, and then $1000 for the LARGEST car club on set! THEN Jay Blaze is hosting the $1000 “Buss it Down” contest! 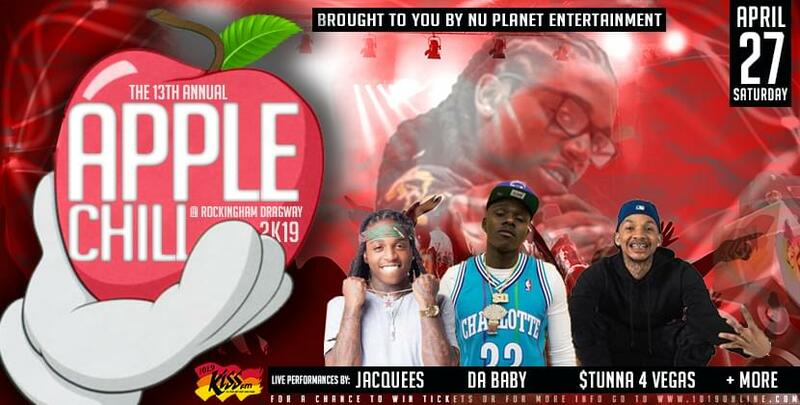 Then shutting the stage down with a live performance from Jacquees, and introducing that North Carolina New Wave of Hip Hop…DA BABY aka Baby Jesus! To win your way inside register by clicking HERE or listen to 101.9 Kiss FM 2pm-7pm, whenever you hear a song from Da Baby or Jacquees call 800-633-6102 be caller #10 and you WIN! SIMPLE!!! NOW for you BALLERS and SHOT CALLERS purchase your tickets by clicking HERE! The 13th Annual Apple Chill 2019 Saturday April 27th at the Rockingham Drag way located at 2153 North US Hwy 1, Rockingham NC! For vendors, Opening Acts and more call 252-578-3504!